Looking past modern houses built into the hillside onto the city centre from our hotel room at the Mercure Panorama. Freiburg is an enigma. It's big (220,000), but it feels intimate when you walk the trails or the streets of the city. Situated on the edge of the Black Forest at the southernmost tip of Germany, bordering both Switzerland and France, it boasts a lovely climate and towering tree lined hiking trails that wind around the mountains and down into the city. Most of the city centre looks like a medieval village. The streets are brick and cobblestone and there are no cars allowed. There are streets for trams and bicycles and pedestrians so the pace is different without cars. 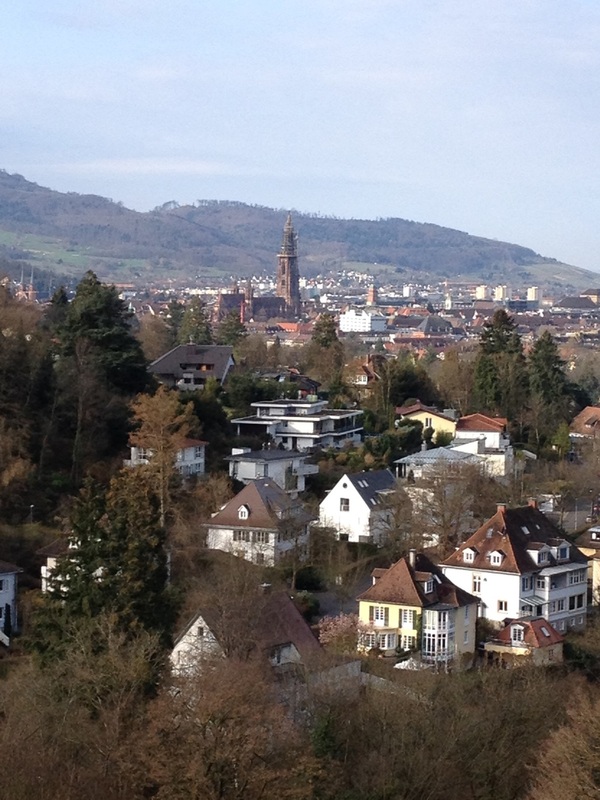 Freiburg is actually a green city (it would like to be the greenest city in the world). The people are friendly, helpful and everyone we met on the trails was in excellent physical health. Although there are big stores, as you would expect in a larger city, the shopping experience on side streets was charming and surprisingly fruitful. Much German food involves meat and potatoes but there are 7 restaurants with a Michelin star in the Freiburg area! We had sone amazing meals. 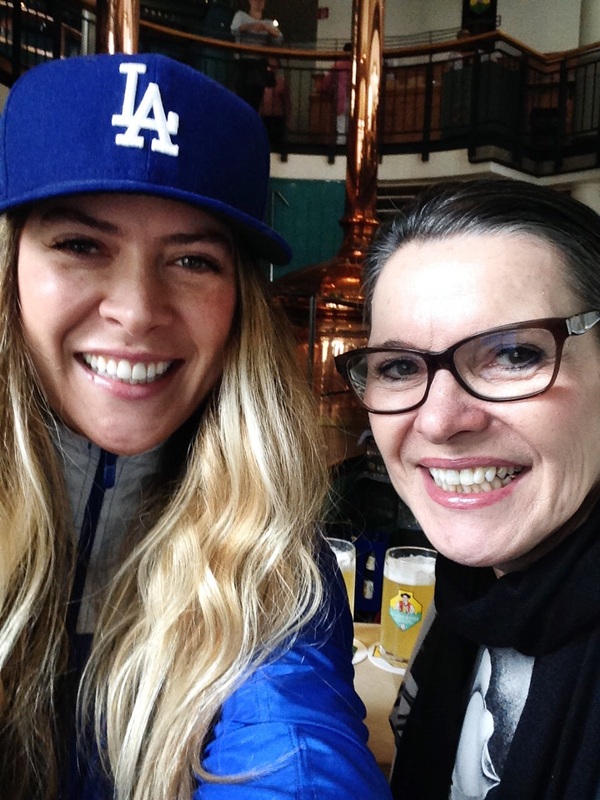 Everywhere we went, in restaurants, hiking paths, outdoor cafes, spas, and even a great brewery, we met people of all ages who enjoyed life together and genuinely shared the space with one another. Our western culture could benefit from this inclusive attitude. 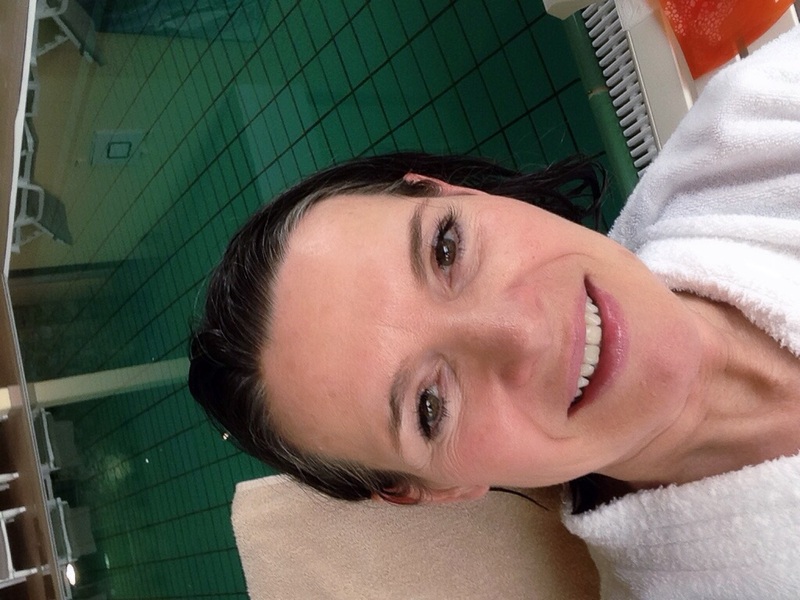 Spending a whole day at the hot springs mineral baths was a most exhilarating and rejuvenating experience. 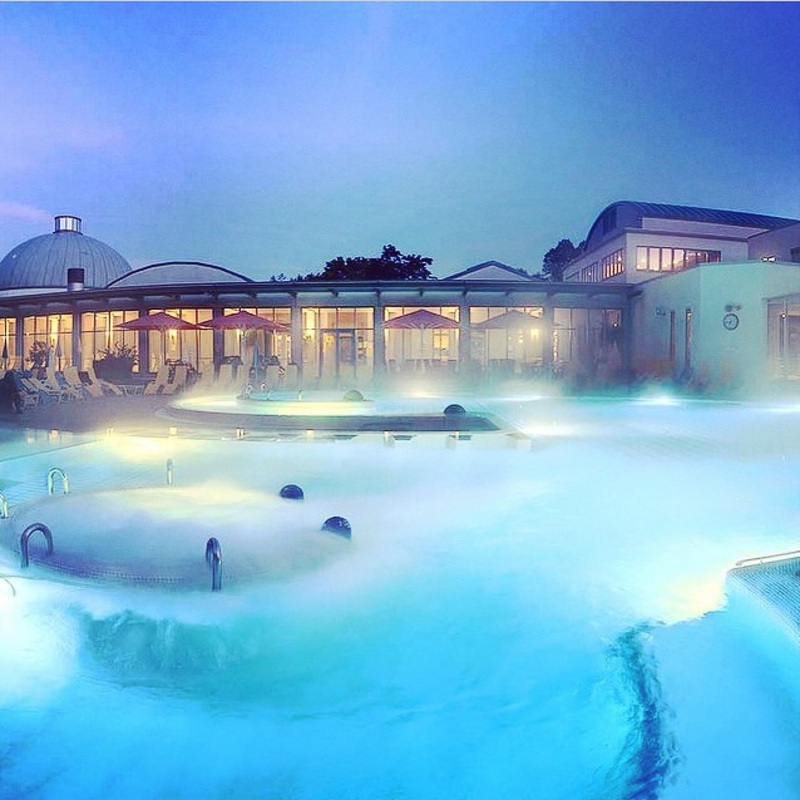 Going to the spa is a way of life here. We have some pretty funny stories about naked people in the sauna who might have thought we were from another planet with our bathing suits on. 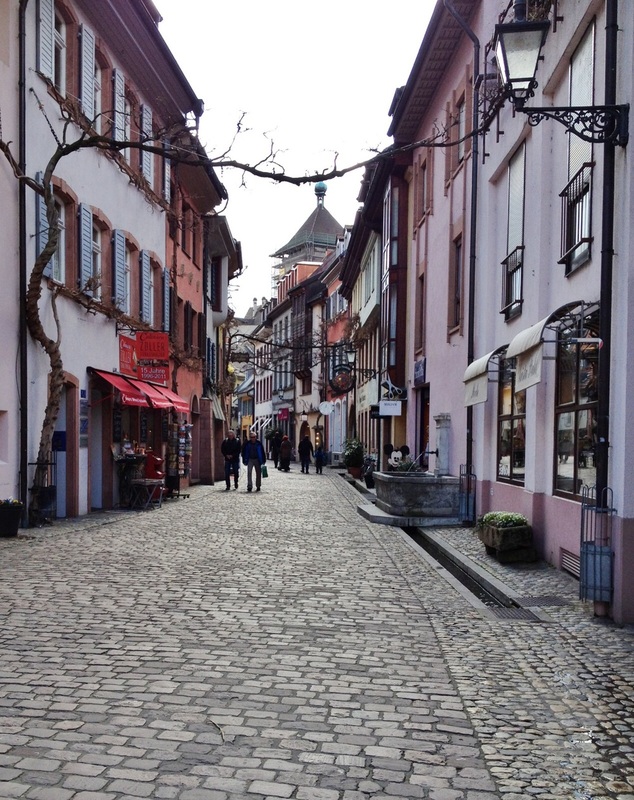 Relaxed and totally enamoured with Freiburg! Excited to be at Baselworld again, looking for gemstones and diamonds. A big, beautiful no heat Ceylon sapphire. The colour is spectacular. Many gemstones on the market are heated to enhance their natural colour, so the point is made when a stone has not undergone any enhancement. A ruby that is the colour of pigeon's blood is the most sought after. This is also a no heat stone. Very beautiful. 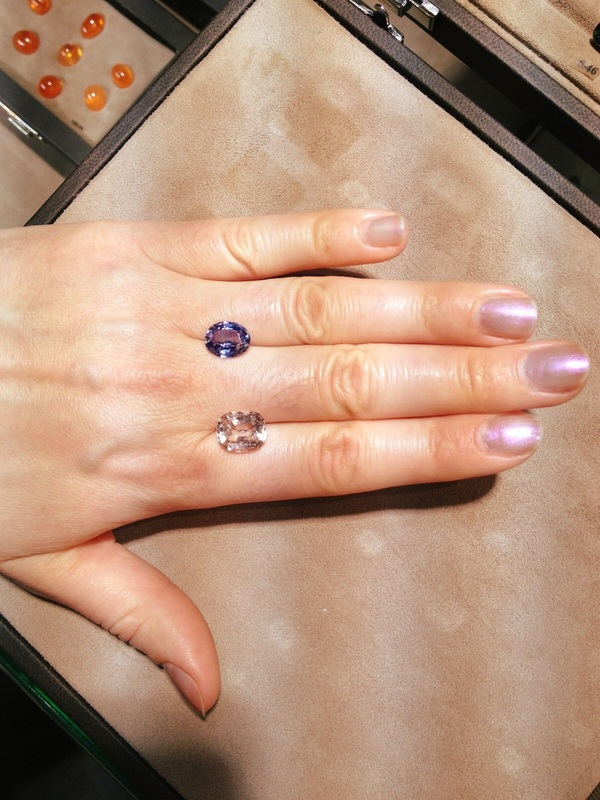 These sapphires, a cornflower blue and a pale peach are both lovely natural colours. No heat. An apricot coloured sapphire with great character. After looking for many loose stones and considering how each one would be designed into a piece of special jewelry, we began to develop an idea for a new collection using ruby, blue sapphire and diamond beads. The pieces will be wearable for every day or out on the town. We love the simplicity of a floating diamond on your skin. We're thinking of calling the collection "Naked Gems". These are lines of diamond beads. 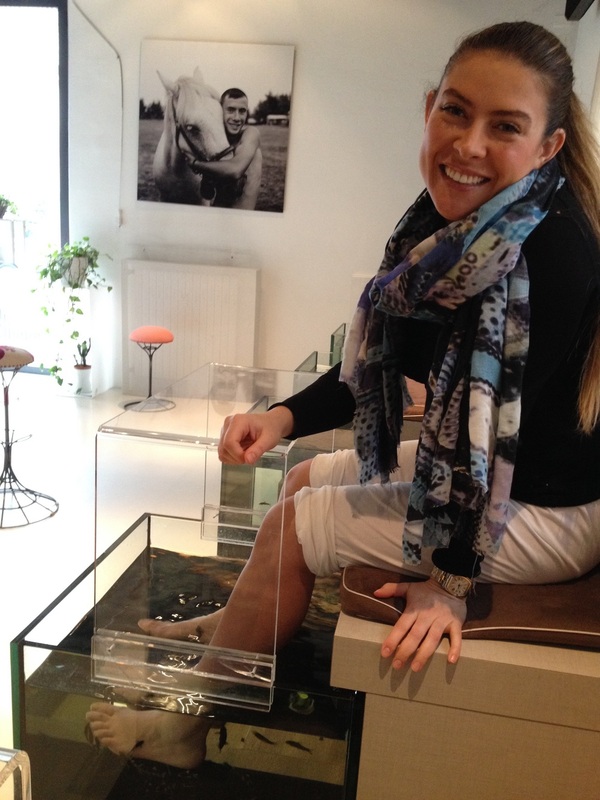 In preparation for our strenuous walking at COSMOPACK and COSMOPROF, we thought we would indulge in fish therapy! These little guys enthusiastically removed all the dead skin from our feet, which was amazing, but the best part was the laugh therapy, a side effect we got from the hilarity of the situation (and the art on the walls). Spring has sprung in Italy. What a treat for two Canadian women in The month of March. Victoria was able, in two days, to find access to everything she needs for building her skin and makeup line. 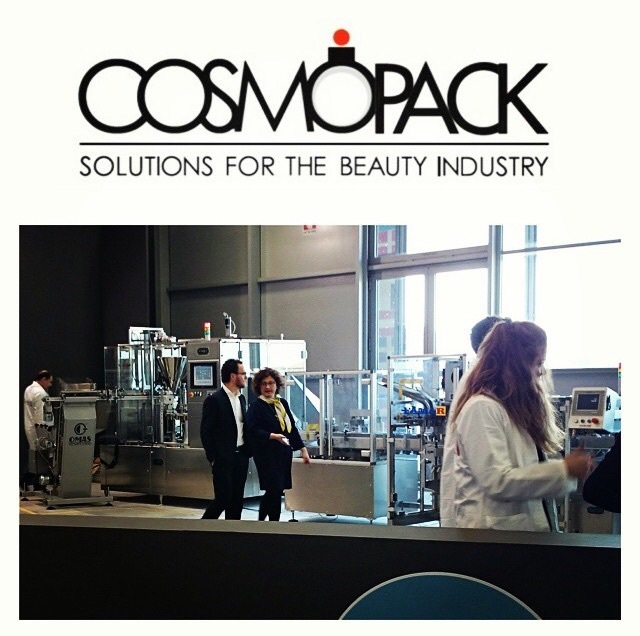 We had business meetings with old and new contacts in order to find the innovative formulas and packaging we were looking for. We were honoured to be invited to this Italian mansion for a traditional seven course dinner for about 100 people, given by the owner of HCT. He really knows how to say thank you to his clients. It was amazing in every way! Enjoying time with our new friends at HCT for a night out. Italian style. Dessert was served at midnight. 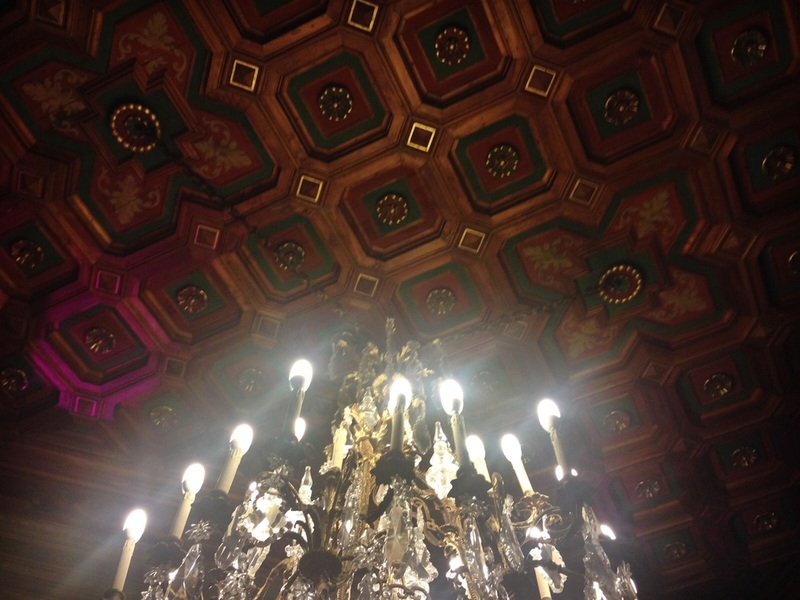 This elegant, painted coffered ceiling over our dinner table had to be photographed. Breakfast in Milan. Can't beat that gorgeous farm egg colour. Outside it was rainy but our outlook was sunny as we hit the cobblestones with a mission for fashion. As usual, Motherdaughter Europe is blooming magical. 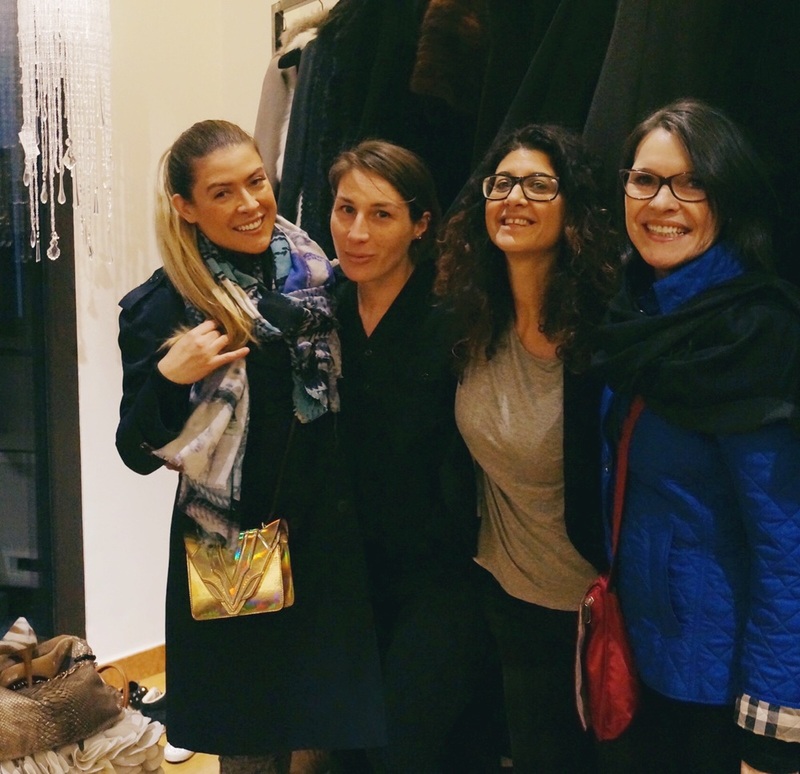 We were so fortunate and delighted to be looked after by three Italian stylists who confidently outfitted me to the nines with beautiful fashion and provided us with a number of places for delectable eating. My number one stylist, daughter Victoria! The making of Italian Brenda. So fun. Discussing fashion, makeup and jewelry collections overlooking the Duomo at dinner. Inspired by Milan! We entered the Diamond Show in the lovely, light-filled Markthalle in Basel, with a mission to find the perfect three carat Pear Shape diamond for a special client’s engagement ring. The diamonds were breathtaking. Every shape was in evidence, up to 10 ct and above, in white and every natural colour. Many of the diamond sellers were second, third or fourth generation of their family business. We chatted with diamond sellers from Israel, Switzerland, Hong Kong and the US. We were treated to delicacies and cappuccino as we examined potential stones and got to know the people. It was exciting to be able to photograph a number of serious contenders for pride of place on the finger of the bride-to-be. We sent the images for client comment and approval before we settled on the final beauty: almost 3 ½ carats. Buying diamonds isn't just about looking for a pretty stone with good specs. Each diamond must be examined with a loupe to reveal its character before we know that "this is the one" for our client. The trust relationship with the diamond seller is very important to develop. It is a process and it takes time. Watch for the companion Blog: The Engagement Ring Design Process. 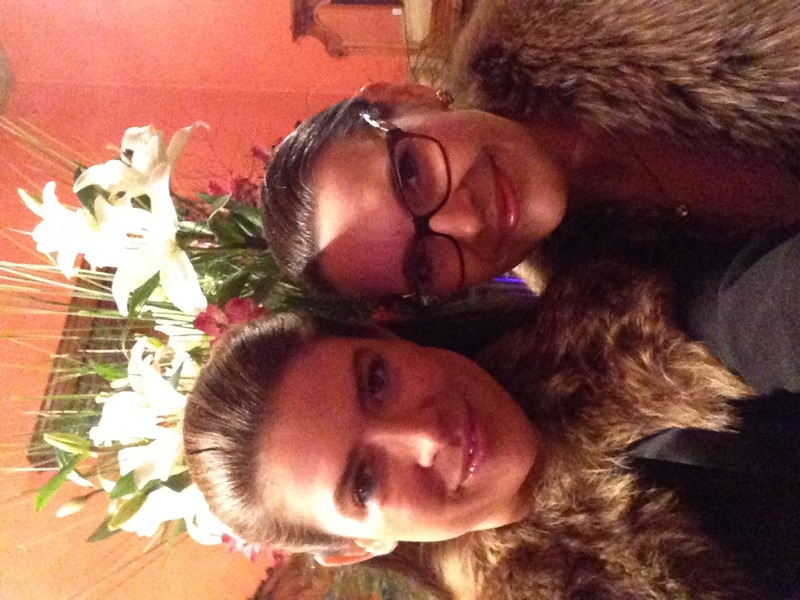 My daughter, Victoria and I travelled to Switzerland and Italy this year for business and for fun. We went to The Diamond Show in Basel, Switzerland where we met fascinating people and were treated extremely well. The Diamond Show was a blast. It is important to get to know who you’re going to do business with, and that can take a little time. It’s also important to have some fun so things aren’t all about work. The first bit of fun came when we saw The Gatspy bracelet created by Choco Diamonds. Art Deco inspired with repeated orderly lines, it was covered with internally flawless diamonds. Victoria was invited to try it on. Her youth and beauty created a bit of buzz and she was asked if she would agree to a video interview wearing the bracelet. She did very well on camera - no surprise to me. The Gatsby by Choco Diamonds. With over 500 diamonds in all shapes and sizes, the sparkle was like nothing else I have ever experienced.